around groups of fabric threads (the latter is called needle weaving). 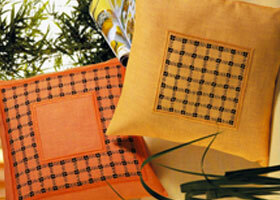 Add various decorative stitches that are worked to secure the edges. In spite of the tremendous variety found in this technique, it's always clearly structured, as it follows the grain of the fabric. 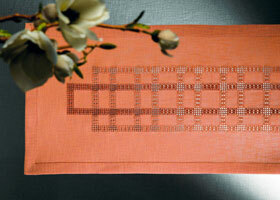 All plain, even-weave needlework fabrics are suitable for drawn-thread embroidery. (Booklet 134) and (Booklet 180) If a border is worked over corners, then the exact same number of warp and weft threads have to be removed so that the lengthwise and crosswise hemstitched stripes are the same width. For quick projects we recommend somewhat coarser fabrics. 3711 ARIOSA (19 threads/inch) and 3409 FEIN-ARIOSA (22 threads/inch) with their interesting textured surface make narrow hem-stitched borders really stand out. 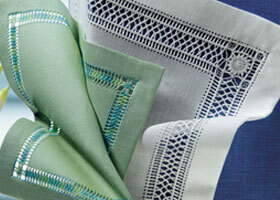 Rustic linen blends such as 1198 FLOBA (17.5 threads/inch) or 3998 GROSS-FLOBA (14 threads/inch) also give a certain charm. 3256 BELLANA (20 threads/inch) is always suitable for learning embroidery techniques. Moving on to larger cushion projects in booklet 180 3438 COLMAR (25 threads/inch)is that bit finer than Bellana. Particularly lovely embroidery textures are guaranteed on the linen blends 3604 DUBLIN (10 threads/cm or 25 threads/inch) and 3281 CASHEL (28 threads/inch). Working this embroidery technique on fine weaves doesn't necessarily mean more intensive work. It all depends upon how many stitches are bundled together with each stitch. You should, however, have some experience with counted embroidery before tackling projects worked on 3217 EDINBURGH (36 threads/inch) or 3348 NEWCASTLE (40 threads/inch). The type used is not solely dependent upon the fabric used but also on the pattern. When working basic hemstitching, the thread weight should be about the same as that of the fabric threads. A somewhat heavier thread is recommended for needleweaving. There are no strict rules, however. Feel free to experiment! Fold in and iron hem allowance; stitch with drawn-thread hemstitching. Myreschka is a special type of drawn threadwork.